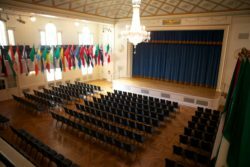 International House offers the perfect location for special events of every size and description – conferences, weddings, concerts, receptions, team meetings, and more. With its distinctive architecture, I-House has also been a popular location for film and television productions since the 1930s. It’s facade has been featured in such memorable films as Mr. Deeds Goes to Town, On the Town, and Burn After Reading. 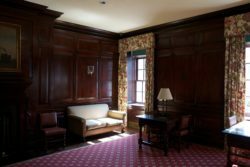 Television viewers may recognize I-House interiors in episodes of Madame Secretary, The Blacklist: Redemption, The Path, Gossip Girl, and, of course, Law and Order. Discounted rates are available for International House Alumni. 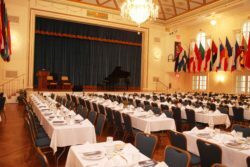 Davis Hall offers a grand piano, full proscenium stage with sound system and lighting. It is ideal for wedding receptions, gala dinners and other large scale events. The capacity is about 525 people, including balcony seating. The room is in the style of a typical New England Meeting House, except for the chandelier and the stage. Palladian-style windows line the balcony, and the chandelier is hung from an intricate skylight. 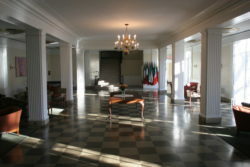 This spacious foyer space just outside Davis Hall is decorated with memorabilia from more than 90 years of International House history. 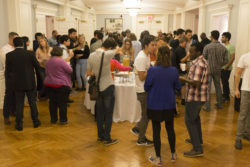 It features overhead views of Sakura Park, a grand piano, and serves as a lovely space for cocktails receptions independently or in conjunction with events in Davis Hall or the Home Room. Overlooking Grant’s Tomb, this intimate space is decorated with rare Chinese tapestries. The room has its own kitchen and a capacity of 60. With a grand piano, it is ideal for recitals, rehearsals, receptions and seminars. 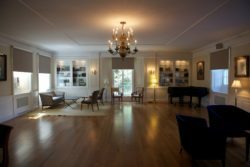 Designed in the Classical Revival style, the Main Lounge serves as the “living room” of I-House. This highly symmetrical space a working fireplace with a hand-carved mantle in the center of the north wall, grand piano and breathtaking views of Sakura Park. With a capacity of about 200, it is an ideal space for receptions and recitals. This handsomely paneled space, intimate space is located just off the Main Lounge. With a capacity of 60, it provides a distinguished setting for meetings and presentations. Contact Claribel Pavlik, Assistant Director of Resident & Guest Services, for more information at 212-316-8453 or cpavlik@ihouse-nyc.org.